28S-WAW-115 is a ‘28Standard’ 4Ground kit, as you would expect it has loads of detail and pre-painted parts. Each storey is removable allowing maximum in-game access to each one of the many rooms. The storeys are held in place with locator lugs in each corner. This Grand Stone Hotel will look great on any Napoleonic or Post Napoleonic battlefield, this style became common from the 1800’s onwards, with many examples from as far away as Russia to Northern Spain and Northern Italy to Britain and Scandinavia still standing today. As a part of 4Ground’s immensely popular ‘World at War’ range for WWI and WWII it makes a great defensible objective in any European action. Add this building alongside the Stone hotel, with it’s Stone Coaching Stable and Cookhouse and the effect is an even more desirable battlefield worth fighting for! Once the passengers had alighted from their coach to enter at the front of the hotel via the main entrance with ornate steps and decretive ashlar stone entrance with scroll work and pillars in relief. A welcoming sight in peace time for many a coach bound traveller this C18th Hotel (with restaurant offering much better food and accommodation than a Coaching Inn) offered a welcomed respite on long journeys. 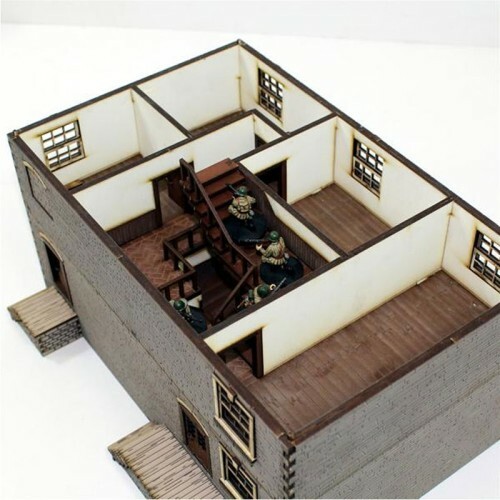 As part of a battlefield this building really helps when creating an interesting scenario; either as an operational HQ on a rural roadside or as a well defended bastion in the centre of a hard fought street fight. 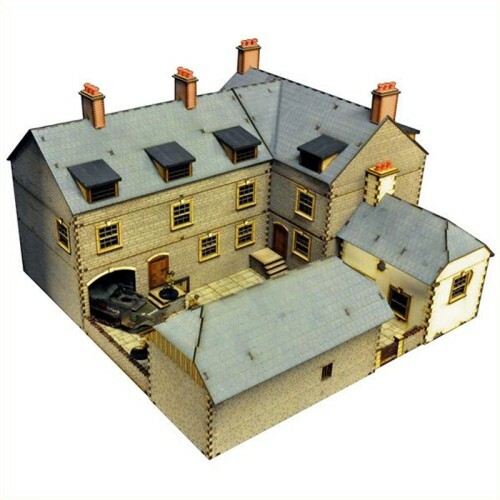 The external walls for this kit are pre-painted and etched with rubble stonework coursing, with little external details like sash windows and a grilled coal chute all adding to the overall effect of this high quality laser cut model kit. Internally the walls are also pre-painted and those walls adjoining the banistered, central staircase have oak half panelling, as do the walls in the saloon bar. A large part of the ground floor is taken up with a restaurant and lounge. In the main hallway there is a reception desk and a grand staircase leading up to the residential floors. 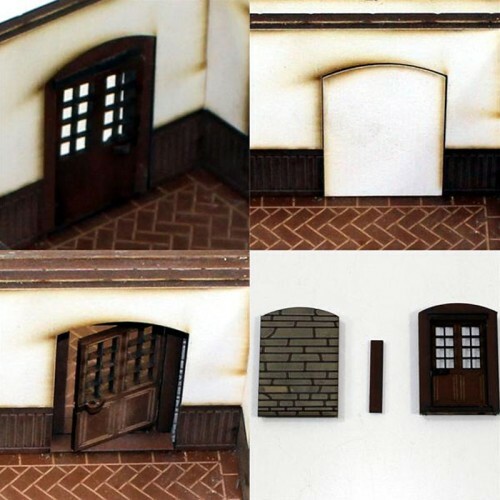 Please note that the options for the door are interchangable and do not need to be glued in place making this a versitile piece of terrain.